OnePlus launched the latest Smartphone OnePlus 6T in Global Event on Monday. The phone was presented at an event held in New York. Today, OnePlus 6T will be launched in the Indian market on Tuesday. OnePlus 6T is an upgraded variant of the last OnePlus 6 of the company. Its most important feature is the in-display fingerprint sensor, Waterdrop Noch, 3700mAh battery and improved camera. 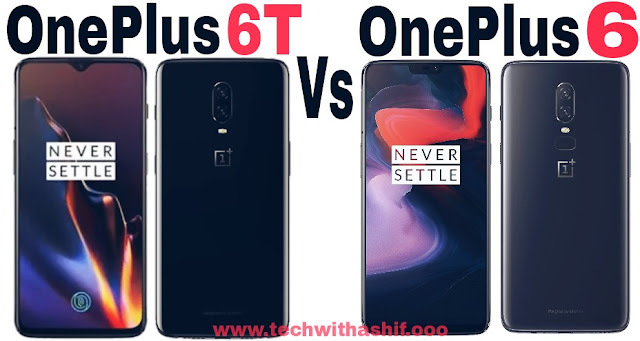 How different is the new onePlus 6T compared to the OnePlus 6 launched in May? How different are the two phones in terms of processor, RAM, camera and connectivity features? OnePlus 6T's 6 GB RAM / 128GB Storage (Mirror Black Variant) costs $ 549 (about Rs 40,300). The 8 GB RAM / 128 GB storage mirror black and midnight black variant costs $ 579 (Rs 42,500). At the same time, the price of 8 GB RAM / 256 GB of midnight black variant is $ 629 (about Rs 46,200). Let's say that OnePlus 6 was launched in the US at $ 529 (about Rs 38,800). At the same time, in the US, onePlus 6T's base variant has 128 GB storage, while OnePlus 6 has 64 GB inbuilt storage. OnePlus 6T is launched in Midnight Black and Mirror Black Color. On the other hand, OnePlus 6 comes in Midnight Black, Mirror Black and Silk White Limited Edition variant. OnePlus 6T of India has not yet revealed the price. However, it has already been confirmed that the Smartphone will be sold on Amazon India from November 1. OnePlus 6T has 6.41 inch Full HD + (1080x2340 pixels) optic amoled panel whose aspect ratio is 19.5: 9. The phone has Corning Gorilla Glass 6 protection. There is 6.28 inch Full HD + (1080x2280 pixels) optic amoled display in the OnePlus 6, which has an aspect ratio of 19: 9. Corning Gorilla Glass 5 has been provided for safety in the phone. Processor of OnePlus 6T & OnePlus 6 Both Octa-Core Qualcomm Snapdragon 845 processor has been given in both OnePlus 6T and Oneplus 6. Adreno 630 GPU is available for graphics. OnePlus 6T and OnePlus 6 get the option of 6 GB RAM and 8 GB RAM. OnePlus 6T has been launched in 128 GB and 256GB storage variant. The base variant of OnePlus 6 comes with 64 GB inbuilt storage variant. OnePlus 6 and OnePlus 6T both dual nano-SIM cards do support. OnePlus 6T Android 9.0 runs on Pie-based Oxygen OS, while OnePlus 6 was last updated on the latest Android operating system. Talking about connectivity, portions like 4G VoLTE, Dual-Band Wi-Fi 802.11 AC, Bluetooth 5.0, NFC, GPS / A-GPS and USB Type-C are given in both phones. In OnePlus 6, 3.5mm audio jack has been given, while in OnePlus 6T, users will not get this feature. OnePlus 6T and Oneplus 6 have been given Accelerometer, Ambient Light Sensor, Electronic Compass, Gyroscope and Proximity Sensors. OnePlus 6T has an In-display fingerprint sensor while fingerprint sensor is available on the rear in OnePlus 6. Software based face unlock sensors have been provided in both the phones. The dimensions of oneplus 6 t are 157.5x74.8x8.2 millimeters and weighing 185 grams. The dimensions of the oneplus 6 are 155.7x75.4x7.75 millimeters and weighing 177 grams. A smart boost feature is also available for better app experiences in OnePlus 6T. Talking about the camera department, the Dual Rear Camera Setup has been given in both the OnePlus 6T and Oneplus 6. In both handsets, the 20-megapixel Sony IMX376K secondary sensor with aperture F / 1.7, OIS and EIS has 16 megapixel primary and aperture F / 1.7. For selfie, 16-megapixel Sony IMX371 sensor with aperture F / 2.0 and EIS has been given in both OnePlus smartphones. The company is praising the nightscape mode given in OnePlus 6T and says that low-light photography has been better than ever. Talk to the battery to give power to OnePlus 6T, the 3700mAh battery comes with Fast Charge Technology. It is claiming to get battery life for 30 days in full charging. Battery is 23 percent bigger than OnePlus 6. OnePlus 6 has a 3300mAh battery, which dashes the charge technology. Friends, share the comments about what these thoughts are in relation to these two smartphones.